Yeroskipos used to be the home of sacred gardens. Now it produces divine sweets. "Just east of Paphos is the village of Yeroskipos, with its cluster of little basket and gift shops strung along the roadside. It is a place well worth exploring with the picturesque five-domed Byzantine church of Ayia Paraskevi and newly renovated Folk Art Museum. The village's history stretches back to ancient times; its name, comes from the classical Greek "Hieros Kipos" meaning "Sacred garden" it is believed that it used to be an extensive area of beautiful gardens, filled with fragrant flowers and pomegranate trees, dedicated to the goddess Aphrodite. Pilgrims would rest in the gardens on their journey to the sacred temple at Kouklia from the old harbour at Paphos. a euphemism increasingly used since 1974 to describe what is called Turkish delight in English�are made (in Greek, their name, Loukoumia, has no geographical connotations). Roadside stalls are piled high with brightly coloured boxes of these delicious sweets and the owners stand in the shop doorway and warmly invite you inside to watch the sweets being made. 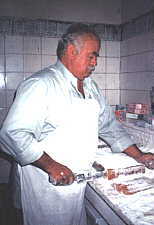 Cyprus Delights have been made in the village since 1895 and the little factories are all family concerns thet have been handed down through the generations. Each family closely guards their secret recipes! 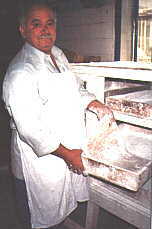 Inside one of the shops Savvas can be seen cutting large slabs of the cooled sweet mixture. He has been making sweets in the same workshop started by his grandfather for over forty years now, and he makes the sweets in the same way as he was taught when he was a boy. He was happy to show me how to make the best loukoumia: Every morning, three enormous copper cauldrons are filled with water and the fires lit underneath them. Once the water has boiled the sugar is added and the solution is boiled for an hour, stirred continuously by an electric paddle. Next the starch is added, and the mixture brought back to the boil, for another five to six hours until it is smooth and shiny. The mixture is allowed to cool for a while, before the various flavours are added. There are twenty four to choose from including cherry, lemon, almond and chocolate, as well as the traditional rose flavour. The rose flavouring is made by the villagers at this time of year by boiling handfuls of fragrant rose petals and Collecting the condensed moisture. After the flavourings have been carefully added, the mixture is poured into large wooden trays to set. About five hours later it is ready to be cut into squares, liberally dusted with icing sugar and packed into small boxes lined with greaseproof paper ready for selling. Unlike many imitations the loukoumia made in Cyprus does not contain gelatine and its high quality and smooth taste is much appreciated by clients from all around the world who regularly send orders to the shops. not soft almonds coated in a hard, bright pink coating, but freshly roasted, locally grown almonds with a creamy coloured sugar coating that simply melts away. The almond nuts are washed and Slowly roasted before being put into large rottating copper cauldron, which is heated by a flame. The nuts are basted with a sugar syrup until they are evenly coated and then allowed to cool slightly before the process is repeated. After several more coatings, the almonds are allowed to cool thoroughly before being boxed ready to be put on the shelves to sell. As I left, Savvas mentioned with a smile that the loukoumia and sugared almonds are best eaten within two months. "No problem," I assured him!